The woodgrain piece surrounding the gauges is non-stock, and I have replaced it with a stock black piece since these photos were taken. The woodgrain on the leather-wrapped steering wheel IS stock. 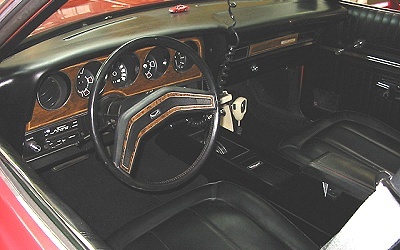 When Scott T. rebuilt this car, he thought the woodgrain around the gauges would look nice with the steering wheel. I agreed, and left it in there for five years. I still have it, and can easily put it back in if my mood changes.